Now for something fun! Let’s control a Sonos from a Particle Photon and a connected button. I connected a Grove Button to the Particle with simple male-to-female wires. The SIG line on the button should go to a digital port (D0 in my case). When the button is pressed, the port will read HIGH and otherwise LOW. Controlling Sonos is another matter though. 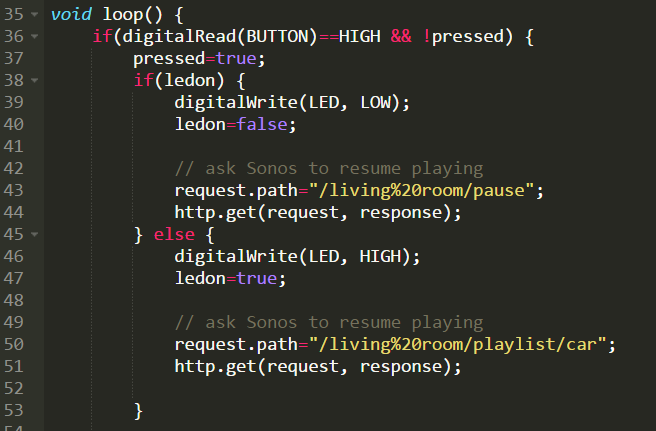 Sonos should really make simple APIs available and/or provide access through IFTTT and similar services. 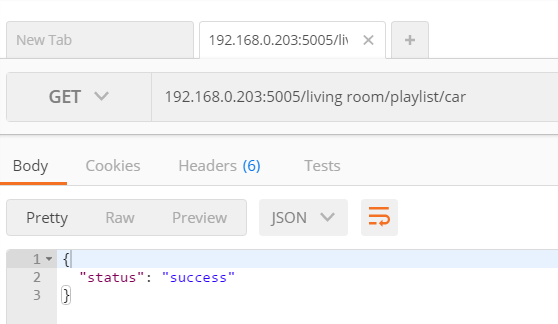 Until they do that, you will need to control Sonos the hard way, by connecting directly to it from the Particle and sending commands over their HTTP interface. Luckily, the people from Hover Labs, have some code on GitHub that you can build upon. I simply copied their code in my Particle app and removed references to the Hover device. By the way, the Hover is a cool device in its own right that you should definitely check out as well! In the above snippet, you see part to the loop() code that checks for a button press. 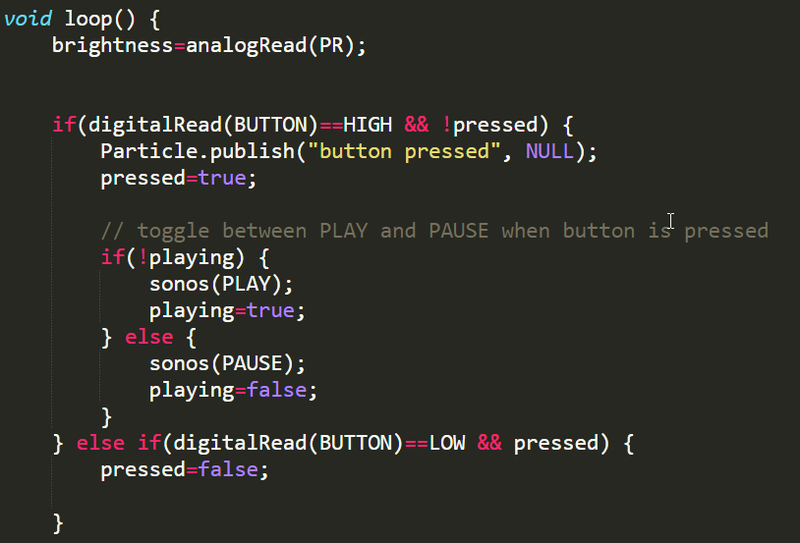 Since we want to toggle between Sonos PLAY and PAUSE, there’s some code for that. The hard work is done by the sonos() function which takes commands like PLAY, PAUSE, NEXT, PREVIOUS. You can check out the full code in the following gist: https://gist.github.com/gbaeke/240fb221204ff828dec06150014ec5fd. Note that the code also contains the LED and photoresitor code from earlier examples. The Sonos control is also very basic as it only implements PLAY and PAUSE so you need something in the queue. But at least you have a start to create more complex interactions. 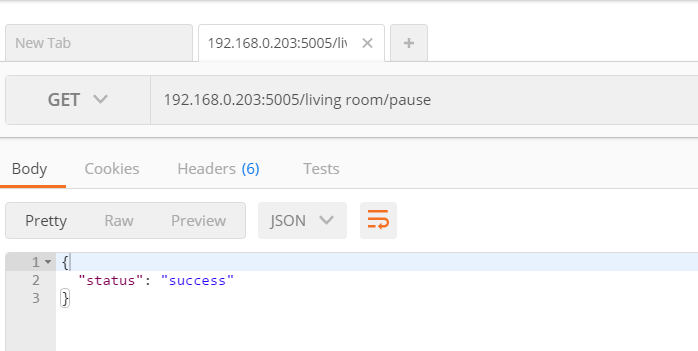 You could also create a Particle Function that executes the Sonos code which would enable you to control your Sonos from the cloud and even connect this with other services via IFTTT. For instance, you could start playing your Sonos when you are arriving home. Have fun controlling Sonos from your Particle!!! 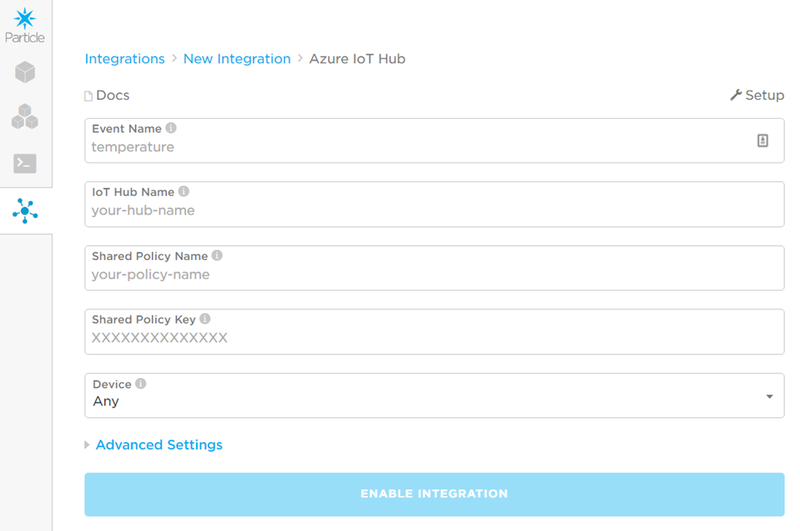 In this post, I will take a look at Azure IoT Hub integration which, at the moment of writing, is still in beta. Note that this integration works with events you publish from your device with Particle.publish and not with Particle Variables or Functions. Remember that in the post about events, we published a lights on and lights out event. For simplicity, we will build upon those events here. 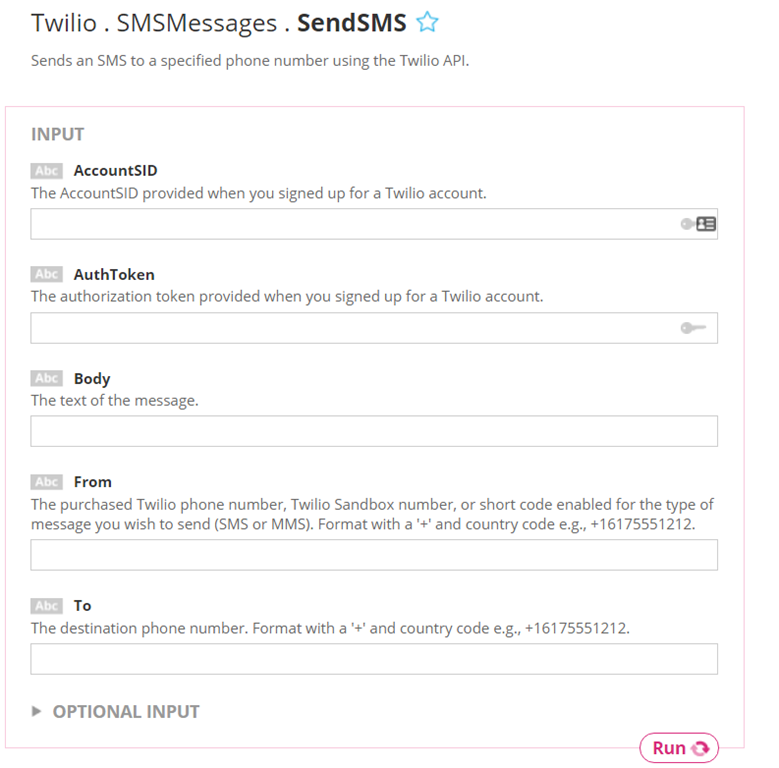 An IoT Hub has a name and works with shared access policies and access keys to be able to control the IoT Hub and send messages. 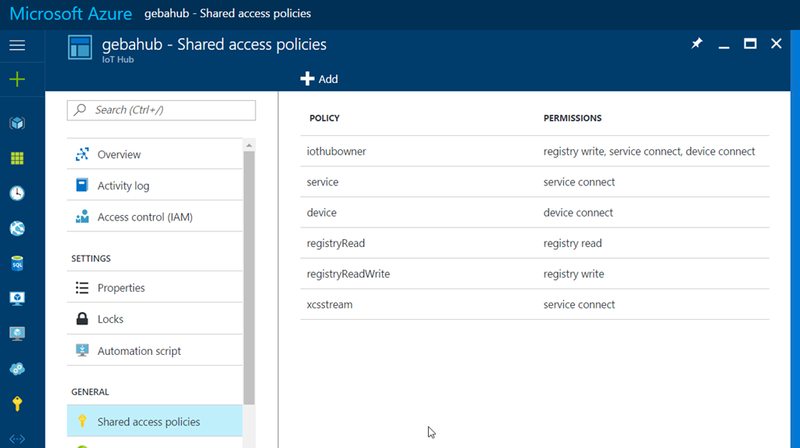 To get to the policies, just click Shared Access Policies. Although considered bad practice, I will use the iothubowner policy which has all required rights. Click iothubowner to view the access keys and note the primary access key. You will need that key in a moment. 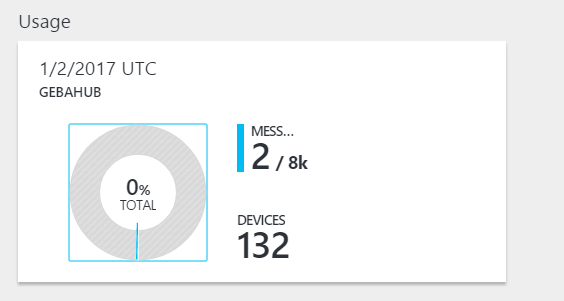 It’s pretty self explanatory once you have your IoT Hub created in Azure. 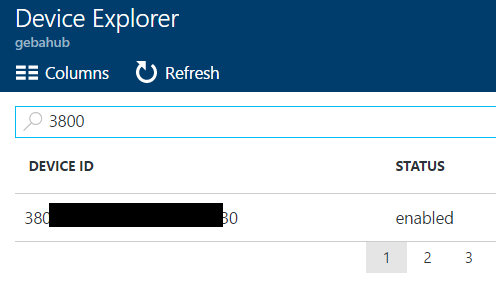 Just fill in the required information and note that the event name is the name of the event you have given in the call to Particle.publish. My events are called lights on and lights out and I will use lights as Event Name. This will catch both events! 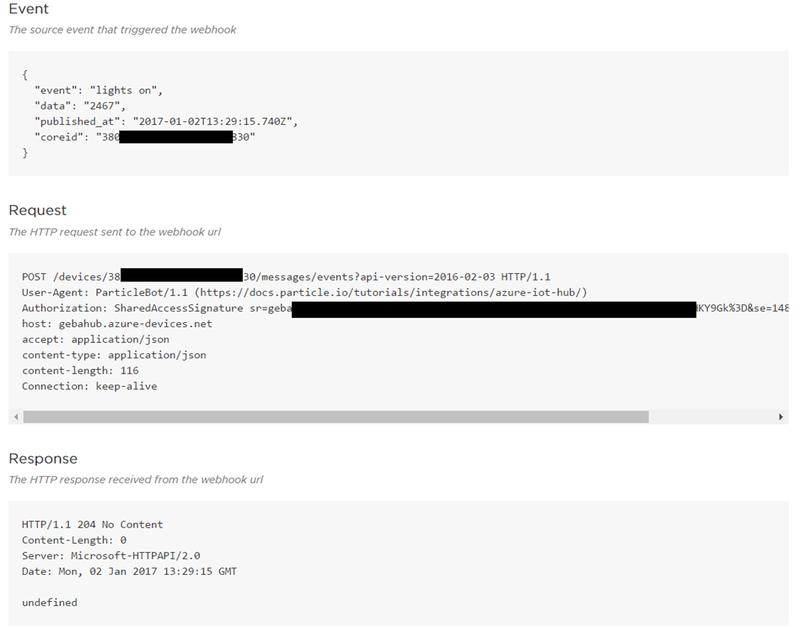 You see the event payload that was sent to IoT Hub plus details about the call to IoT Hub using HTTP POST. What you do now with these messages is up to you. You can use the new endpoints and routes feature of IoT Hub to forward events to Event Hubs or Service Bus. Or you could connect Stream Analytics to IoT Hub and save your events to Azure Storage, Data Lake, SQL, Document DB or stream the data to a real-time Power BI dashboard. Note that although an Azure Subscription is free, not all services have free tiers. 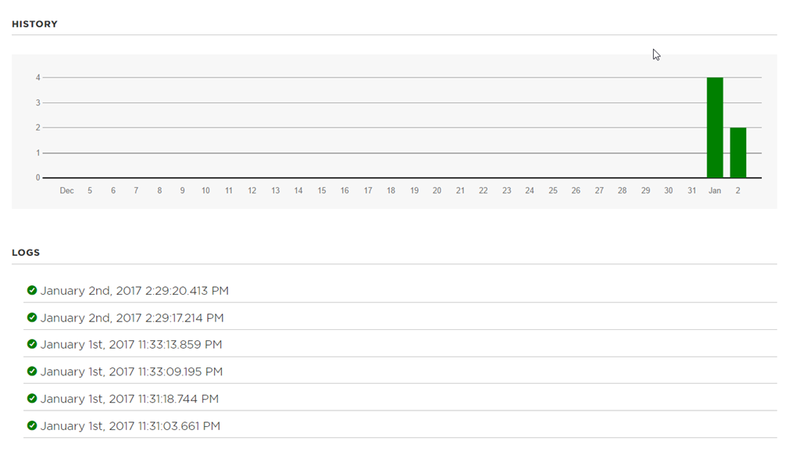 For instance, IoT Hub has a free tier but Stream Analytics does not. And although IoT Hub’s free tier is great to get started, it can only process a limited amount of events. It’s up to you to control the rate of events sent from your devices. For home use or small PoCs you should not run into issues though!